On Saturday, October 20th, from 3 to 10, wine lovers will have the opportunity to taste wines from seventeen of Kentucky’s wineries. Party Town will sponsor the Seventh Annual Northern Kentucky Wine Festival at the MainStrasse Village in Covington. For a $10 admission, visitors can sample four wines and enjoy live entertainment. Extra tickets for tastings and glasses of wine can be purchased separately. Artisans and local food vendors will be there to add to the enjoyment of the day. Visitors can taste wines from Northern Kentucky wineries: Elk Creek Vineyards, Stonebrook Winery, Atwood Hill, Generation Hill Winery, Baker- Bird Winery, Seven Wells Vineyard & Winery, Redman’s Farm Winery, Rose Hill Farm Winery, and Serendipity Winery will have booths. Chrisman Mill Vineyards, Lovers Leap Vineyards Winery, and Black Barn Winery from the Bluegrass Region; Horseshoe Bend Vineyards, WhiteMoon Winery, and Old 502 Winery from the Derby Region; Purple Toad Winery from the Western Region; and Cedar Creek Vineyards from the Southeastern Region of the state will also offer wines for tasting and buying. The MainStrasse Village and the Northern Kentucky Vintner & Grape Growers Association have joined together to give visitors an experience that has grown into one of the best wine festivals in the state. The location on the Sixth Street Promenade at the Goose Girl Fountain provides a historic ambiance for wine lovers to wile away the late afternoon and evening while enjoying Kentucky wines. 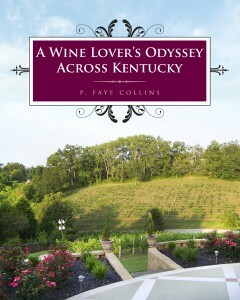 I will be signing and selling copies of A Wine Lover’s Odyssey Across Kentucky at the festival. I hope to see you there. Equus Run Vineyards, from Midway will also be participating at the Northern Kentucky Wine Festival. I just found out today that Verona Vineyards, in Boone County, will also be at the wine festival. Check out my June posts to read about them.